We are a leading Exporter of hot forging die lubricants from Mumbai, India. 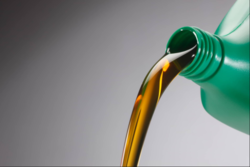 Eco- friendly lubricants which increase forging die life and reduce pollution are the need of the hour. • Improved surface finish of the forged components. • 100% increase in die life. • Improved productivity of the forge shop. Industries catered to: Hot forging (steel and non-ferrous alloys). Exported to: Vietnam, Malaysia and Sharjah. Looking for Hot Forging Die Lubricants ?